You just opened a valuable bottle of wine. Sipped a glass enjoying the most heavenly taste you’ve ever felt. But what do you do with the leftover beverage? Leave it to oxidize in the fridge? Throw it away? Use it for cooking? Preserving it might be the best idea! A wine preserver will certainly help you in this mission. But what is it? And which is the best? Read our guide to find out how to preserve wine or, if you already know everything on the matter, use the links below to jump to our selection of the best wine preservers on the market. Do You Need A Wine Preserver? Wine preserver is a general name. The phrase includes a series of wine accessories designed to help you preserve the organoleptic properties of wine that has been exposed to oxygen. In other words, open wine. Wine is a tricky beverage. In fact, as soon as it comes in contact with air, the wine begins to oxidize. In the case of aged reds, oxidation will enhance the wine’s flavors and aromas. But only for a short time. Whites are even more delicate. Nevertheless, experts came up with several solutions that can help preserve open wine. Let’s have a look at them. To preserve wine you have to limit oxygen exposure. Once the bottle is open, it is quite difficult to remove the air from it, but there are some methods that allow you to do that. These wine preservation systems use various technologies to preserve the beverage for a period of time that varies from a couple of days to weeks and even months. The best way to preserve open wine is by not opening it in the first place. Confused? 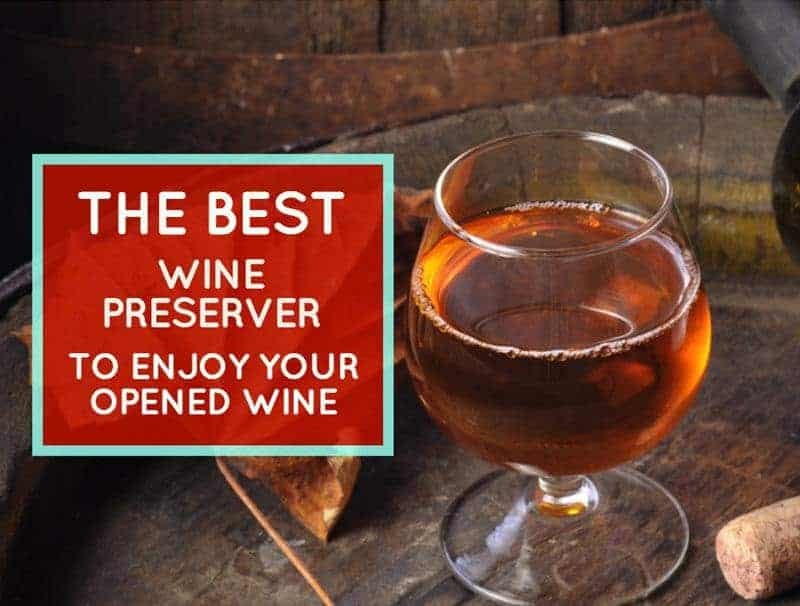 Well, you should know that some of the most performing wine preserving systems allows you to access wine without uncorking the bottle. The most popular high-end system is Coravin. Coravin is a device that consists of a long needle and a recipient containing an inert gas. To pour yourself a glass, you’ll have to pierce the cork with the needle and pour. The system will inject the inert gas into the bottle as the liquid comes out, preventing air to make its way in. Thanks to this innovative system, you will be able to enjoy a glass of the most expensive wine without ruining the qualities of the leftover beverage. Nevertheless, because of the cost of this system, most casual drinkers prefer to invest in more affordable solutions. In this category is included a number of devices designed to pump wine out of the bottle and aerate it while pouring. Because these devices are applied on the neck of the bottle and stick to it with airtight seals, they also have the property of preserving wine, albeit for a shorter time. The most performing wine preserver and aerator is Genesis. This device comes with several caps and the system injects an inert gas into the bottle right after opening, pushing out any air that might have got into the bottle. In this case, air exposure is minimal and the wine will preserve its properties for a few weeks. Genesis also works with sparkling wine, preserving it for up to 5 days. The other wine aerator and preserver pumps work on the same principle but without the use of inert gas. As such, unless you decide to use inert gas separately, they are only able to preserve wine for up to a week. The most inexpensive wine preservers are the wine vacuum pumps. The principle that stands behind their use is simple. The vacuum removes air from the bottle, therefore the wine is preserved. However, vacuum pumps are not able to remove all air from the bottle, therefore wine will still be exposed to a minimal amount of oxygen. When used properly, this method is able to preserve wine for up to a week. Probably the simplest way to preserve wine is with the help of inert gas. The same used by Coravin and Genesis. Inert gas sprays are available commercially and they come at affordable prices. A single container of gas can preserve more than 100 bottles, meaning that it will last for a really long time. To preserve wine, simply fill the bottle with the inert gas coming from the spray. This will push air out and will form a protective layer on the surface of the wine. Apply an airtight wine stopper on the bottle to prevent gas from coming out of the bottle. The drawback of this method is that you will have to refill the bottle with wine each time you pour yourself a glass. It depends! What type of wine do you usually drink? How often it happens to have leftover wine? If you only drink regular supermarket wine, then maybe investing in a wine preserver is not worthy. If you always finish the bottles as soon as you open them, a wine preserver is useless. On the other hand, if you’ve started learning about wine and enjoy more valuable bottles, then you might need a wine preserver. What type of wine preserver depends on many factors. As a general rule, to keep the properties of a good wine, a wine vacuum pump of inert gas might be sufficient. If you usually drink reds, then it might even be worth it investing in a wine aerator and dispenser, although these devices have higher prices. On the other hand, if you are a true connoisseur and usually drink valuable wine, then you shouldn’t settle for anything less than a high-end wine preserver. If you don’t have fancy requirements but need a regular wine preserver, let’s have a look at the best options on the market! One of the most popular and inexpensive wine preservation systems is The Original Vacu Vin, a wine vacuum pump designed to remove the air from an open bottle and seal it tightly to prevent oxidation. The pump is sold with at least two vacuum stoppers, although the manufacturer proposes solutions that include up to 8 stoppers. As it is easy to imagine, more stoppers mean that you can open more than one bottle at the same time. Nevertheless, keep in mind that this method will only allow you to preserve wine for up to a week in the best of the cases. For this reason, pay attention to how many bottles you actually open. This vacuum pump is made in Netherlands and it complies with all European food safety regulations. Moreover, the patented technology is really easy to use. Purchase options: the Vacu Vin is available in two colors and different purchase options. You will be able to choose between white and black, and packages with one or more vacuum stoppers. Easy to use: to preserve wine, simply seal the bottle with the rubber stopper and remove the air with the pump until you hear a click. At that moment the air is removed. Preserves all still wine: the vacuum pump works perfectly with both white and red wine. Fresh wine for days: this wine preservation method can keep the wine fresh for up to a week, which is plenty of time for you to enjoy the beverage. It often happens for the stoppers to fail to work. Replacement stoppers are inexpensive but the issue can be annoying. If Vacu Vin doesn’t convince you, another wine vacuum pump with stoppers to consider is the Vremi Wine Preserver. 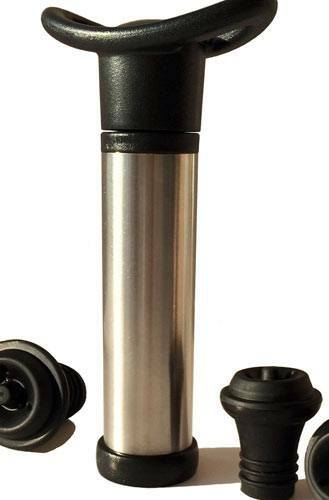 This device has a functioning principle similar with the pump described above and the manufacturer claims that it will keep wine fresh for up to 10 days. 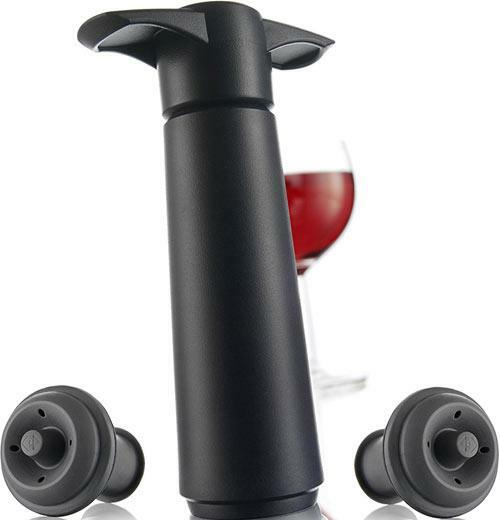 The wine preserver removes all air from an open bottle while the airtight top seal prevents the air from going in, protecting the beverage against oxidation. Besides being easy to use, the system is also easy to clean. You will simply have to rinse the rubber stoppers with warm water and dry them with a soft cloth after use. The pump comes with four rubber stoppers, so you will be able to open up to four bottles at a time. This feature is great, especially if you want to host a wine party. Easy to use: cap the bottles with the rubber stoppers and use the vacuum pump to remove air from the bottle. Date marker: all stoppers include a date marker that will allow you to track for how many days the bottle has been opened. Days of fresh wine: the manufacturer claims that the system is able to keep wine fresh for up to 10 days. Purchase options: besides the package with pump and four stoppers, the manufacturer proposes other solutions with fewer or more rubber seals. The pump works wonderfully but some of the rubber stoppers might fail to work. An issue similar with the Vacu Vin’s. Proimb is a wine vacuum pump made of high-quality stainless steel and with stoppers made of thermoplastic elastomer, a material more environmentally friendly than silicone. 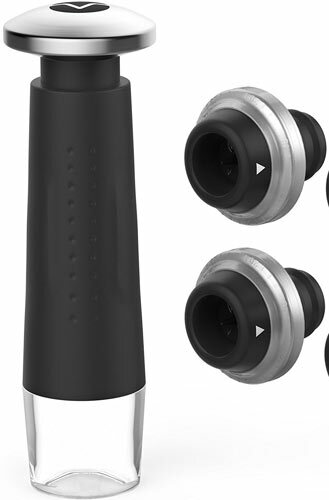 This wine preserver comes with four reusable bottle stoppers and the manufacturer claims that it is able to keep the wine fresh for up to 14 days. This performance is attributable to the material of the wine stoppers that presumably are able to seal the bottles more tightly. A feature we really like is the quality of the pump itself. The pump is made of high-quality stainless steel that can last a lifetime and it has an ergonomic handle designed for easier pumping. Last but not least, the pump comes with a limited warranty of 24 months. Moreover, the company also provides a friendly customer support. Easy to use: the vacuum pump is really easy to use. Simply cap the bottle with the stopper, pump out the air and voila, your wine is ready to be preserved. Easy to clean: rinse the stoppers with clean tap water and dry them before use. It is not recommended to clean them in the dishwasher. Preserves wine for 14 days: the manufacturer claims that it can preserve wine for up to 14 days. Easy to uncap: the stoppers are easy to remove from the bottle by simply releasing the pressure. To do that, press the top of the stopper. There is no indicator to show when the air has been pulled out from the bottle. For this reason, it is hard to decide whether the wine is properly preserved or not. Savino is a different type of wine preserver. This is actually a wine saving carafe made of glass or plastic and designed to keep the wine fresh for up to one week. Without a doubt, this wine preserver carafe is one of the most innovative preservers available on the market. The item uses a simple method to keep wine fresh, it is really easy to use, and you will not need to invest in vacuum pumps or other preservation systems. To keep wine fresh, Savino uses a floating device that stays inside the carafe and seals the surface of the wine tightly whenever you’re not pouring. The device unseals itself autonomously whenever you want to access wine, which is an added convenience. In other words, this wine preserver does everything on its own. Simply fill the carafe with your favorite wine and enjoy the open bottle in the course of a week. Savino has a capacity of 750 ml. Innovative: the floating device creates a physical barrier between the wine and the air, preventing oxidation. Easy to clean: you can simply rinse the carafe with water or wash it in the dishwasher. Made of glass: this carafe is made of glass and designed to preserve the organoleptic properties of the wine. Easy to carry: the carafe can be used anywhere and it is easy to take in on trips, on picnics, or simply at parties. Savino is rather expensive for a carafe. It’s true that it can preserve wine, but the price still seems unjustified. Private Preserve is one of the most inexpensive and popular wine preservers. The product is an inert non-toxic gas designed to form a protective layer on top of the wine, preventing the beverage from coming in contact with air. Compared to similar products, the feature that makes the difference is the unique combination of inert gases this manufacturer uses. In fact, Private Preserve is made of a combination of nitrogen, argon, and carbon dioxide. The spray contains enough gas for over 100 full uses. This means that it can preserve a lot of bottles of your favorite wine and you will be able to use the same spray for years. Private Preserve is also very easy to use. Just place the extension tube into the bottle, fill it with gas and seal it with a rubber or cork wine stopper. FDA approved: Private Preserve is approved by FDA and contains non-toxic, medical-grade, tasteless non-volatile gases. Long lasting: the container holds enough gas to preserve 120 standard bottles of wine. You can use it on bottles of any size though. Days of fresh wine: the gas is proved to preserve the organoleptic properties of wine for up to one week, depending on the type of wine you open. Easy to use: this is probably the simplest to use wine preservation system. Just replace the air in an open bottle with the inert gases and seal the bottle with a wine stopper to prevent the gases from going out. It is really hard to figure out when you’ve added enough gas to the bottle. Choosing the best wine preserver was one of the hardest tasks. However, considering that we have tested wine preservers to use on a day-by-day basis and on regular wines, we’ve made up our mind and chose the Savino wine preserver carafe as the best. This preserving system will keep your wine fresh for a few days, but what makes it stand out is the ease of use. In fact, you’ll not have to pump air out of the bottle or spray inert gas in. Just pour the whole bottle in the carafe and Savino will do the rest. The physical barrier acts on its own and since it’s a floating device it will reseal the wine automatically when you stop pouring. Cleaning and maintenance of Savino is also a breeze, and in spite of the price, this original wine preserver will certainly make a statement in your wine accessories collection. Without a doubt, this is the best amateur wine preserver available on the market!